This style SD-CP bag/pouch is a more economical bag. It measures approximately 18 inches wide by 15 inches high by 4 inches deep. It has a folded sewn style gusset. It is made from #10 – 15 once duck. The main body of the bag is one piece with an additional piece of fabric sewn up around the bottom for accent and strength. The bottom piece matches the one-inch straps in color. This bag comes in natural, which is similar to “off white”. 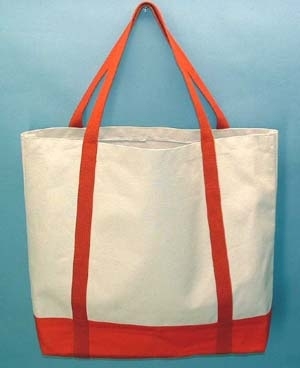 This tote does not compare with your typical “give away” promotional pouch/tote. The straps/handle extend approximately 10 inches off the top edge of the bag. They also travel completely around the bag for additional strength. As with all our products we can change any of the measurements to accommodate your intended task. This may be something as simple as changing the finish strap/handle height to making the bag wider. We can embroider/monogram or silk-screen anything that you may need on one or both sides of the bag if necessary.